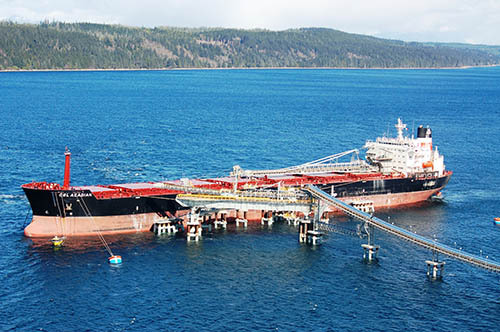 The Orca Deep Sea Terminal and Shiploader is owned by Orca Sand and Gravel near Port McNeill, British Columbia, Canada. The Orca Sand and Gravel quarry is entirely new with a peak capacity of 6 million tonnes per year. The quarry produces construction aggregates which is shipped through a dedicated vessel loading facility. 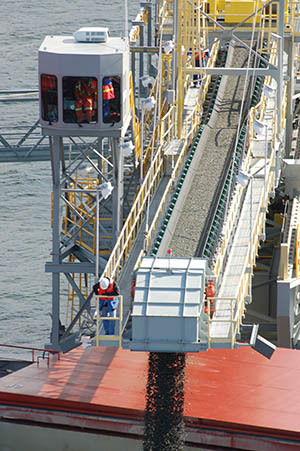 Seabulk designed and managed the supply and construction of the offshore conveyor, shiploader and vessel berth. The project began January 2006 and the first barges and ships began loading in March 2007. The terminal is designed for vessels up to 70 000 tonnes with minimal shifting of the vessel during loading. The foundations are a mix of pile driven and cast in place structures. To aid the pile driving steel jackets were prefabricated to guide the piles. The caps and quadrant beam are precast concrete. 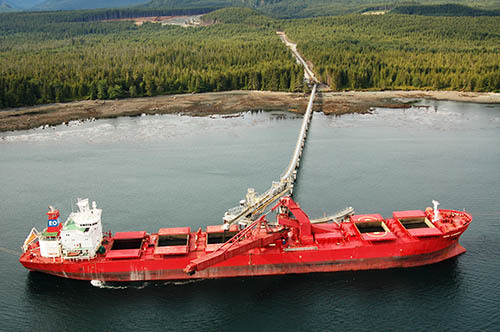 The offshore conveyor is made up of 35 metre long truss sections that were fabricated in China with outfitting of the mechanical and electrical components in Nanaimo, B.C. The trusses were then placed on the foundations from the water. The shiploader was completely fabricated and outfitted near Victoria, B.C.. The shiploader was loaded onto a barge and brought to its final location. A floating crane was used to lift the shiploader onto the pivot foundation and quadrant rail.